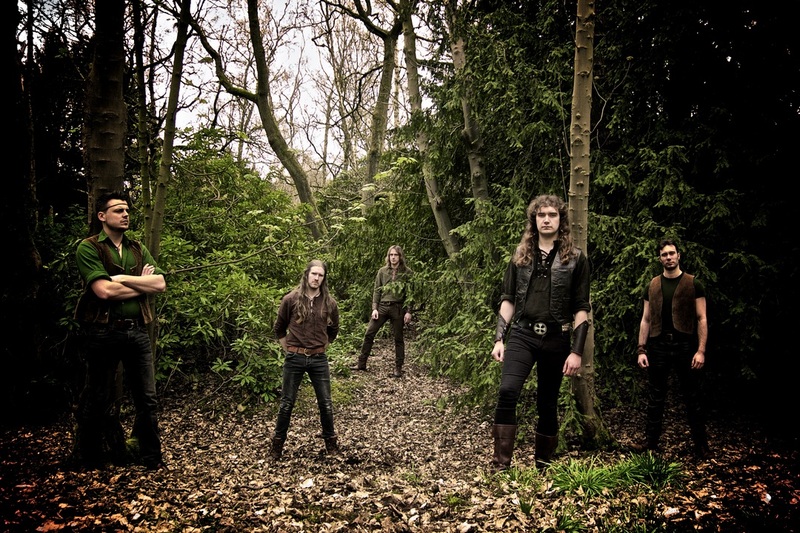 The British heavy/power metal band Dark Forest are back with their fourth full-length album Beyond The Veil. Guitarist Christian Horton fills us in on the new record, tour plans, his musical background and other subjects. Chad Bowar: How did the songwriting process for Beyond The Veil compare to your previous albums‭? Christian Horton: It was pretty similar, really.‭ ‬A song usually starts from a core riff or melody and then we gradually add to it.‭ ‬We like to make the songs interesting and full of music, so we‭’‬re always writing little ideas and storing them for future use in songs.‭ ‬It‭’‬s all about finding melodies that fit the atmosphere of the rest of the song,‭ ‬every melody,‭ ‬riff and vocal line has to make sense within the song as a whole. This is the first time you’ve had the same lineup for two consecutive albums.‭ ‬How did that affect the creation of the album‭? Yes,‭ ‬it‭’‬s something I‭’‬m very happy about‭! ‬We finally have a solid lineup and it‭’‬s working great.‭ It‭’‬s the most comfortable and also the most creative the band has ever been.‭ ‬In the past there were some disagreements and the classic‭ “musical differences”‬ which resulted in some tough times. But now everyone shares the same vision, so we‭’‬re really pulling together to create the best music to our ability. You worked with producer Ajeet Gill again on this album.‭ ‬What does he bring to the table‭? What‭’‬s also very important is that he‭’‬s so down to earth and friendly,‭ ‬never getting stressed even when the band‭’‬s emotions are running high after sixteen hour recording sessions‭! ‬It definitely makes all the difference. It creates fond memories of the studio experience and the creating of an album. How do you and‭ ‬Patrick go about dividing the guitar parts‭? ‬Is it strictly one does lead,‭ ‬the other rhythm,‭ ‬or does is vary from song to song‭? We both play lead and rhythm, so it varies.‭ ‬It usually depends on who wrote what,‭ ‬so if I come up with a lead guitar melody I‭’‬ll usually be the one who plays it and vice versa.‭ ‬Sometimes if one of us has written the majority of a song then we‭’‬ll divide the lead sections up with each other so we both get to play an equal amount,‭ ‬otherwise the song would become a little boring to play. How has the band’s sound evolved/progressed on this one‭? I think it‭’‬s definitely bigger,‭ ‬also more intricate and complex.‭ ‬I probably say that for every album we make, but it‭’‬s true,‭ ‬each time the sound naturally develops into something bigger and better.‭ ‬There‭’‬s more music generally on this album.‭ Each song is crammed with melodies and changes,‭ ‬we want every song to be the best it can be.‭ ‬Having said that,‭ ‬the roots are still very much there,‭ ‬you can still tell it‭’‬s Dark Forest when you listen to‭ ‬it. Is there a lyrical theme or concept‭? What are your expectations for the album‭? We would love for this album to reach the audience that we think it deserves.‭ ‬We‭’‬re extremely proud of what we‭’‬ve created here.‭ It towers over everything we‭’‬ve done before and we‭’‬ve put our heart and soul into it.‭ ‬We just want as many people as possible to hear it and enjoy it,‭ ‬anything else that comes from that is a bonus. What are your upcoming show/tour plans‭? At the moment we‭’‬re organizing a special album release gig which will be held at a venue local to us and we‭’‬re also playing Hell Over Hammaburg on March‭ 4, ‬2017.‭ ‬There are other gigs in the pipeline too, so watch out for those. What has been your most memorable Dark Forest live show‭? Definitely when we played in Bavaria at Castle Theuern with Atlantean Kodex last November.‭ ‬The venue was beautiful,‭ ‬the crowd was amazing both nights and we just had the best time of our lives‭! How did you get started in music‭? I‭’‬m just self taught.‭ ‬I‭’‬ve never been able to read music or anything,‭ ‬I grew up listening to bands like Iron Maiden and Deep Purple and decided to buy a guitar and teach myself to play it.‭ ‬I must have been about fifteen or sixteen at the time.‭ ‬I started writing music straight away and taught myself how to play along the way.‭ ‬I formed Dark Forest in‭ ‬2002‭ ‬when I was seventeen. Who were your early guitar influences‭? Ritchie Blackmore has always been my favorite guitarist.‭ ‬Deep Purple were the first rock band I got into, so his playing was always special to me.‭ ‬Other names I‭’‬d mention as influences are Adrian Smith,‭ ‬Dave Murray,‭ ‬Tony Iommi,‭ ‬David Gilmour and Phil Cope. What’s the best concert you’ve attended as a fan‭? It has to be my first time seeing Maiden.‭ ‬It was Donington in‭ ‬2003‭ ‬on the‭ ‬”Give Me Ed‭ ‬‘Till I‭’‬m Dead”‬ tour.‭ ‬Nothing will beat that memory. ‬It was a dim,‭ ‬dingy place, but the stage was quite large.‭ ‬I think I remember the four or five people who watched us enjoyed it,‭ ‬or pretended to at least.‭ ‬I don‭’‬t remember actually playing, though.‭ ‬I think I was so scared I mentally blocked it out. What are some of your non-musical hobbies‭ ‬and interests‭? Thanks to everyone who‭’‬s supported us over the years,‭ ‬hope you enjoy Beyond the Veil‭! I‭’‬d like to plug the following:‭ ‬Batham‭’‬s Best Bitter‭! ‬the best ale in the world;‭ ‬and my friend‭’‬s work,‭ ‬Essays and Reflections On The Work Of Colin Wilson‭.